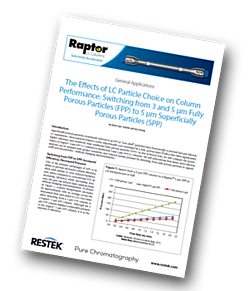 In this technical note from Restek, the performance of Raptor™ 5 μm SPP LC columns to traditional 3 and 5 μm FPP LC columns is compared. Furthermore, it is demonstrated how faster, more efficient analyses can be attained with greater sensitivity and reduced system pressure by switching from fully porous particles to superficially porous particles — without changing instrumentation. Superficially porous particles (commonly referred to as SPP or “core-shell” particles) have been proven to provide fast and efficient LC separations. One of the primary advantages of SPP is its ability to provide increased column efficiency, often with similar or even reduced backpressure, when compared to conventional FPP. By increasing efficiency while decreasing pressure, the user can achieve faster analysis times without changing instrumentation. Column backpressure decreases by approximately 50% on average across the instrument flow-rates tested (0.2 to 2 mL/min) when switching from a 3 μm FPP column to a Raptor™ 5 μm SPP column. Although the 5 μm FPP column displays comparable pressure to the Raptor™ 5 μm SPP column, it is at the expense of efficiency. The invention of SPP has provided analysts with fast separations without the need for expensive ultra high performance liquid chromatography (UHPLC) instruments, thereby increasing sample throughput without capital investment. To investigate the increased speed and efficiency of superficially porous particles, the Raptor™ Biphenyl 5 μm SPP column was compared to columns packed with fully porous 3 and 5 μm particles by performing an assay using identical instrumentation and isocratic method conditions. Raptor™ 5 μm LC columns with superficially porous particles (SPP) display lower backpressure and increased efficiency when compared to columns packed with 3 and 5 μm fully porous particles (FPP) of similar dimension. When used in the development of new assays, Raptor™ 5 μm SPP LC columns offer fast run times and excellent method performance without upgrading instrumentation. When substituted into existing methodologies, switching from conventional 3 μm and 5 μm FPP columns to Raptor™ 5 μm SPP LC columns has the potential to dramatically decrease analysis times while improving efficiency and sensitivity. Certain assays may require some degree of method development to achieve optimal results, but Raptor™ 5 μm LC columns are compatible with most assays and offer an excellent way to increase performance without extra cost or labour.